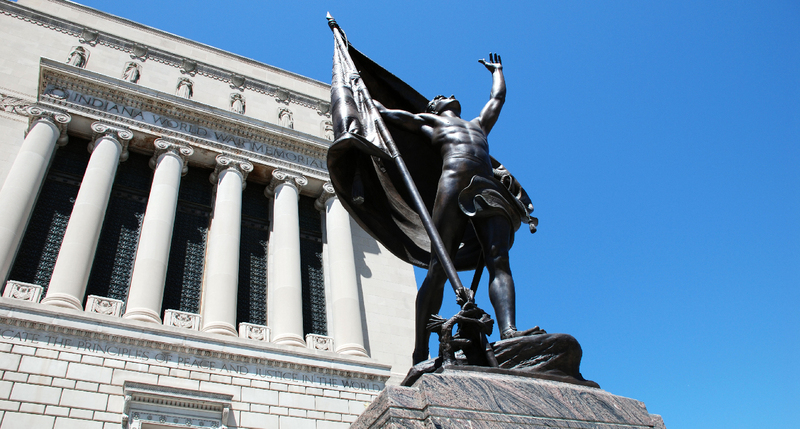 Among the historic war memorials in our Hoosier homeland, the Indiana War Memorial in Indianapolis is a blockbuster, and its star is the Shrine Room. 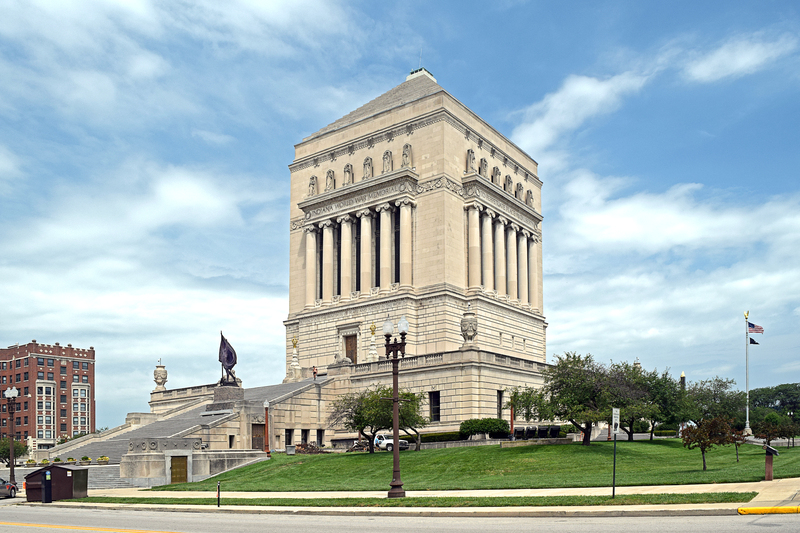 More or less a sequel to the earlier Soldiers and Sailors Monument just down the street, the Indiana War Memorial was created after World War I in part to attract the headquarters of the newly formed American Legion. 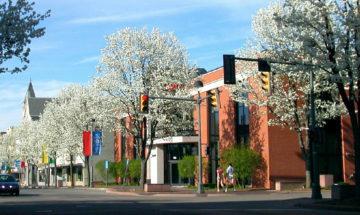 The cornerstone of this lofty endeavor was laid in 1927, though construction of the surrounding plaza was not completed until 1965. From the outside, the memorial is deceptive. 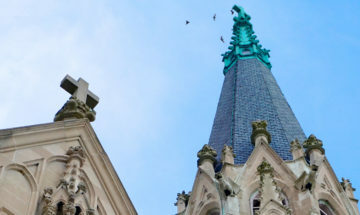 The giant mausoleum-like limestone exterior doesn’t hint at the delights within: oak-paneled rooms, the red plush interior of the grandest little newsreel theater around – and above it all, the hushed expanse of the Shrine Room. Symbolic and fantastic, the Shrine Room is the main event in the thrill ride at the top of the War Memorial. 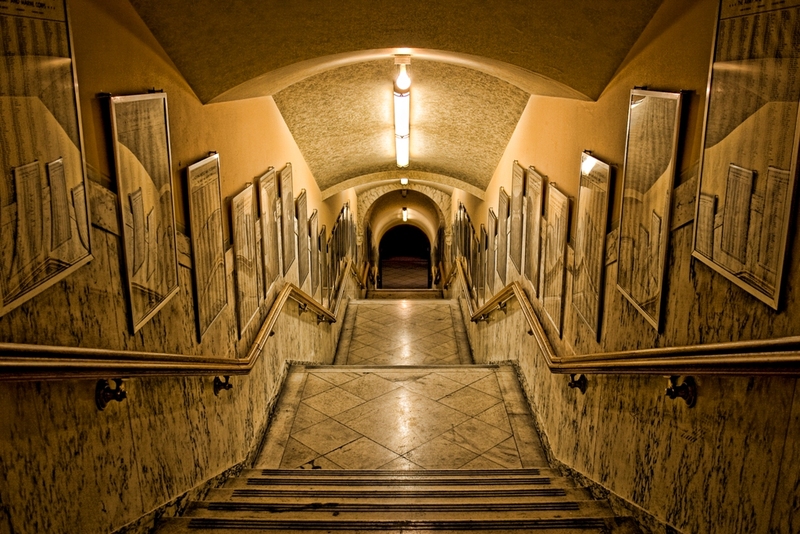 After climbing a narrow brightly lit tunnel of stairs, you step into a dark, cavernous foyer. Up a few more steps, and wait for the head rush. At first, the verticality of the room overwhelms. Then, you become conscious of the deep blue glass windows, the carefully designed mood lighting, and the forest of massive blood-red marble columns that surround the interior. 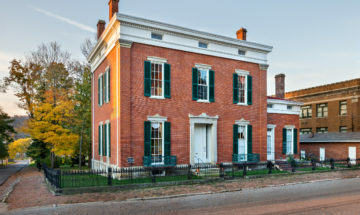 Beyond the columns are a series of softly lit alcoves, almost like chapels, containing gilt-framed portraits of the World War I Allied generals. In the center of the room rests the Altar of Consecration, a giant marble box flanked by unlit torches standards, conjuring images of ancient temples and sacrificial rituals. 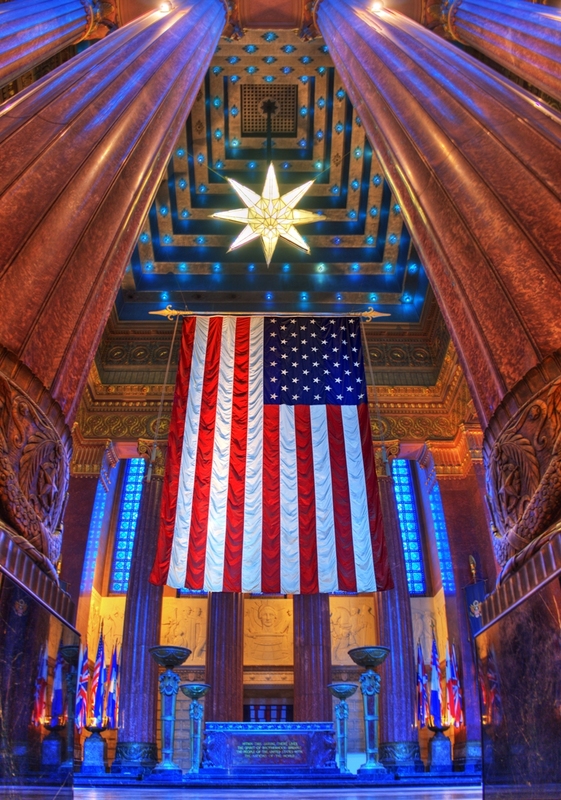 Above the Altar hangs an enormous American flag suspended from invisible wires. The whole show is topped off by the Star of Destiny, a huge light fixture intended to symbolize the continued guidance of our nation. Beyond the Star are tiers of tiny blue light bulbs which flicker mysteriously in the ceiling. Wow. Next time you have friends in from out of town or need to impress a date, take them to the Shrine Room and watch them get dizzy.